All transactions are safe and secure with a reliable history in online purchasing behind each of our associates. Buy the Papa Smurf t-shirt to own Smurfs clothing and merchandise. 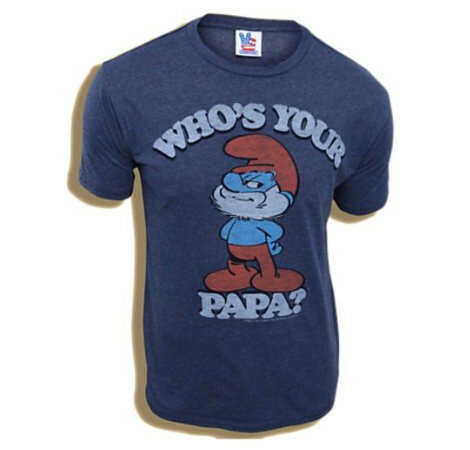 This classic black Papa Smurf t-shirt lets you know exactly who is boss. The white-bearded, blue-faced man knows how to get all the attention with his bright red cap. Apparently, elders get to wear colors other than white because while Papa wears red, Grandpa Smurf wears yellow. He is hard to miss with his spectacles, wooden cane and beard that drags along the ground. Get this tee and some Smurf action figures before they are gone. Remember, the smurfy bird gets the worm. In addition to the Papa Smurf tee above, browse the Smurfs Clothing Gallery for more apparel like men's and women's clothes, kids shirts or hoodies.